Are you stuck in a rut despite your best efforts to get out? Looking for long-term solutions to your problems? We have the best of intentions to improve our conditions, but often our solutions fall short of improving our lives. Sometimes our best efforts can result in the opposite of what we want over time. How can we avoid these unwanted results? If we apply conventional thinking to complex issues, we often maintain or increase the very problems we want to fix. There is, however, a solution to get the desired results. 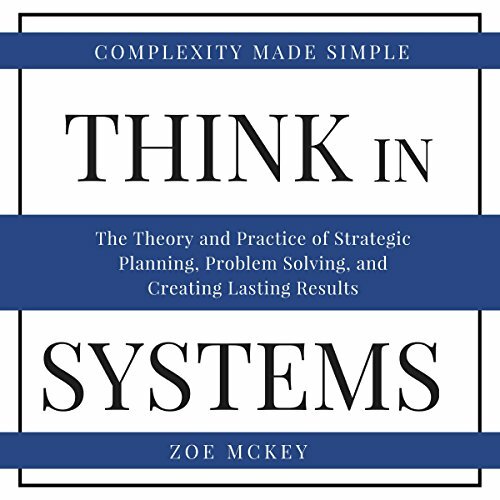 Think in Systems is a concise information manual offering high-level problem-solving methods for personal and global issues. The guide presents the main features of systems thinking in an understandable and everyday manner, helping you to develop this skill top analysts and world leaders use. If you thought that complex thinking is only for people who deal with complex issues like running a company or country, think again. Every issue is complex. Running out of gas is a simple problem, but I’m sure you’re dealing with much greater headaches on a daily basis. Your life is a system. Everything that is connected to your system (life) is a part of it. However, you are just a subsystem in the larger picture. Your town, country, the world, the solar system are all bigger systems you are a part of. These systems are interconnected. Whatever you do will affect the system, and whatever the system does will affect your life. Systems can have positive and negative effect on your life - or on the life of people generally. The greatest problems like hunger, war, and poverty are all failures in the system. Similarly, fights with your loved ones, being stuck in a rut at your job are also system failures. They are not only your fault. Thus they can’t be fixed with a simple cause-effect thinking. Learn to use systems thinking in your business, relationships, friendships, and general political, socio-economic, and environmental issues. Systems thinking boosts your critical thinking skills, makes you more logical, enhances your analytical abilities, and makes you more creative. Systems thinking won’t put extra pressure on your cognition. Quite the contrary, you’ll have fewer headaches knowing that you surely didn’t miss any detail when you tried to solve a problem. Identify your problems more accurately. Find solutions to your problems, don’t just treat the symptoms. Map out a strategic action plan to change your circumstances. Become more patient by understanding the world - and your place in it - better. Shift your focus from the unimportant details and focus on the real issues. Stay a learner. Apply systems thinking in your problem solving, decision making, and strategic planning without the need to become a technical professional. This seems like it's been optimized to check all the boxes for anyone looking for info on the subject, but doesn't go into any depth. I have a system processing outlook on things. This is not a book on developing business systems! Based on the title, I had thought it was a book relating to business systems. This book is more of a personal development book geared toward trying to simplify your life through developing a systems in your personal life. The book overall was OK, it at least was an interesting story and kept my interest. The concept itself (Systems Thinking) is very important in our daily life and in business and Corporate Strategic planning. The book sheds a light on how to think differently towards things and view them in systems with very useful examples from multiple categories which serves as a good and Rich introduction to the topic. In terms of the Performance Quality of the Audio Book, I would give it only 3 stars.